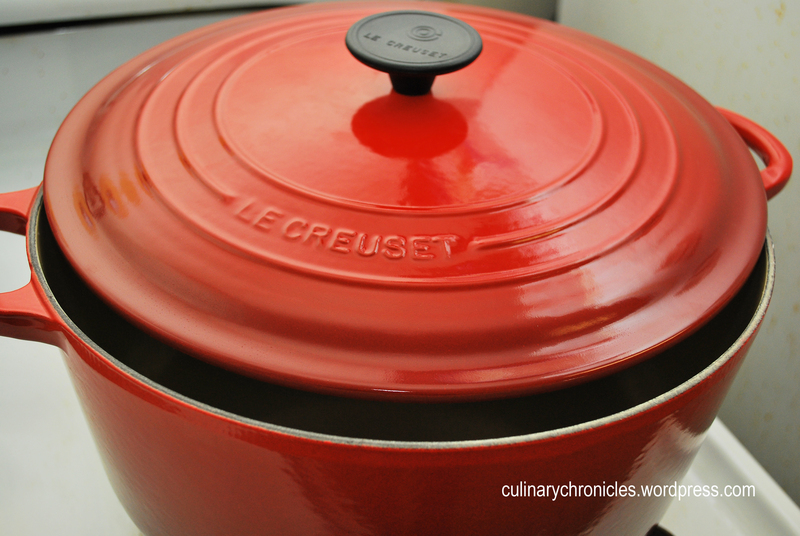 I have dreamed of having my very own Le Creuset Dutch Oven for a long time. And for a “long time”, I mean longer than I even knew what it really was or how fabulous they really were. I think the first memories I could recall of it was back in the day when “The Frugal Gourmet” had one on his stove in the 80’s. And although as a kid I thought it was just a “pretty pot”, I knew I wanted one when I grew up. But this past Christmas…my Culinary Life changed when my awesome sister gave my boyfriend and I a gorgeous 7.25 quart round Dutch Oven. I squealed in delight as I hugged our new beauty—finally, we had one of our very own. Dreamy. I finally settled upon a recipe by Bobby Flay for a Short Rib Ragu with Pappardelle. Although I have NEVER been a fan of how Bobby Flay portrays himself on television, his food more times than not, looks delish. We followed the recipe with the exceptions a few edits and were happy to find that it was pretty simple (although somewhat laborious and lengthy). The end results? D-E-L-I-C-I-O-U-S. 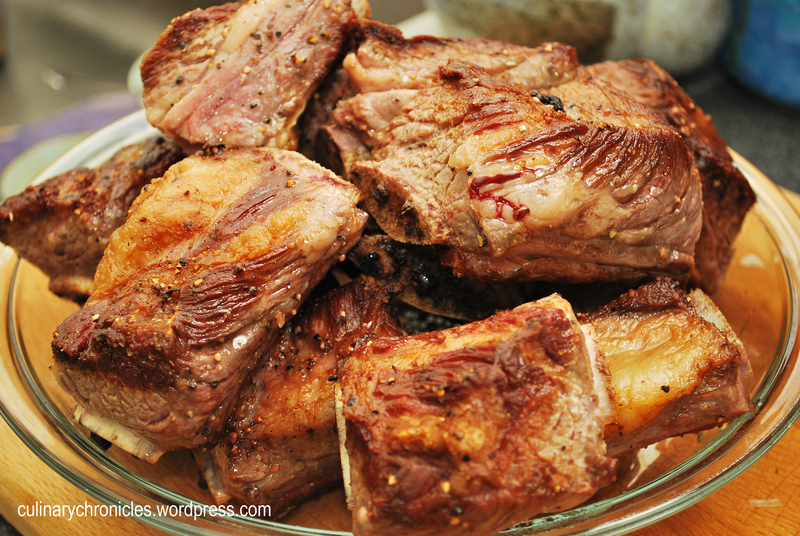 The ribs were succulent and tender with the aromatics giving the meat a rich flavor. We omitted the Port & substituted with beef stock. Ruby Port is often too sweet for me in my savory dishes. We decided not to remove the beef from the bones and served it directly over the pasta. Next time, I think we’ll do it though to get rid of some of the excess gristle and fat. 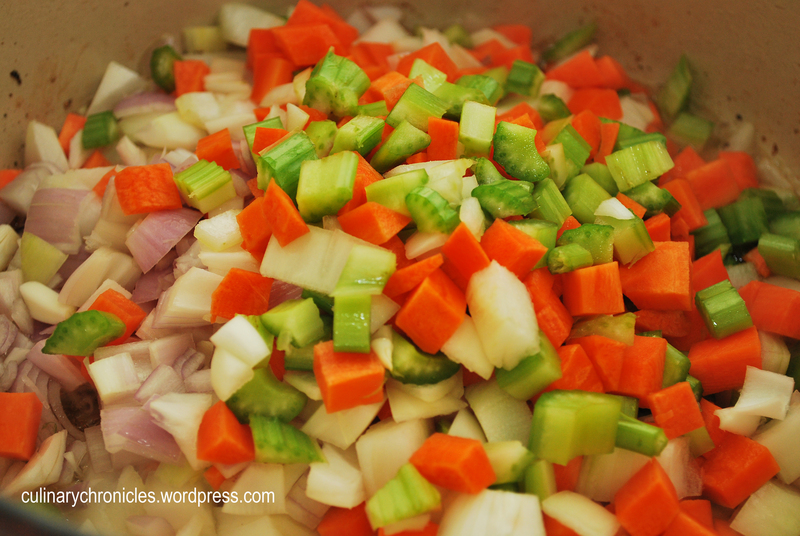 Although the recipe doesn’t state to, season with extra salt and pepper before dishing over the pasta. My “Better Half” thinks a bit of heat would complement the dish. Perhaps some red chili flakes? This recipe could easily serve 6 adults. We had the leftovers a few days later and served the ribs over mashed potatoes—YUM! 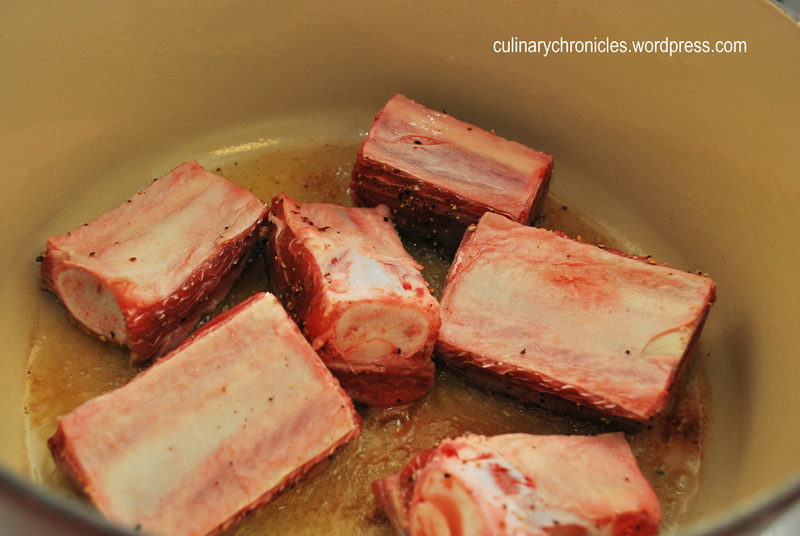 Heavily season the Short Ribs with fresh cracked pepper and kosher salt. 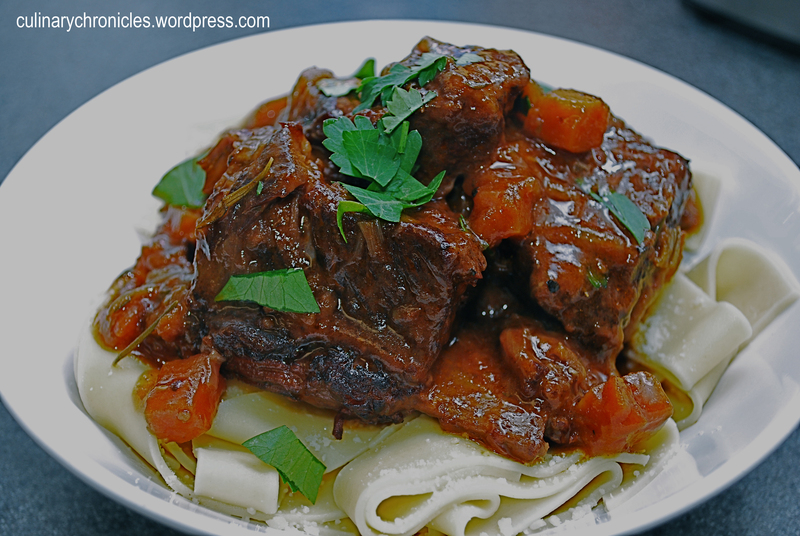 The finished Short Ribs (with bone -in) over Pappardelle. Garnished with Pecorino Romano and Flat Leaf Parsley. shut-up. get the hell out of here. you are driving me nuts with this yummy looking food. what are you doing in higher education, you seriously need to open up your own restaurant. 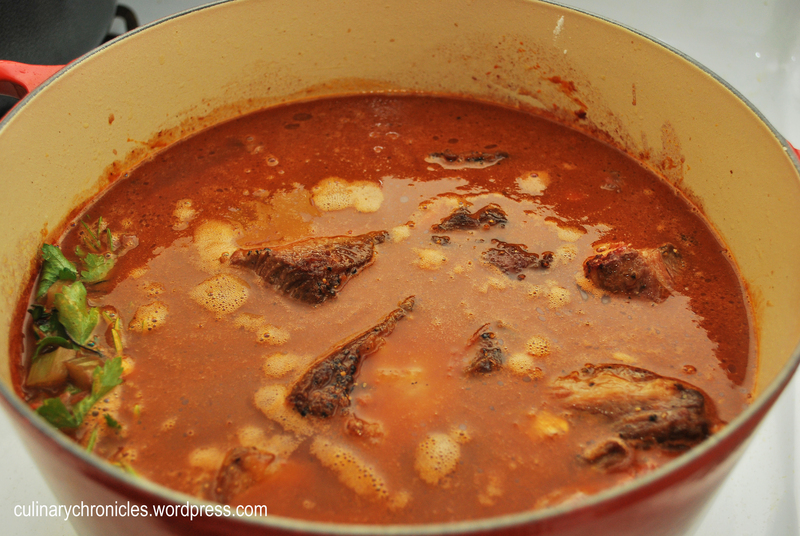 The ragu looks really good. It’s probably good with rice as well and yes, LeCrueset dutch ovens are awesome! Thanks so much! I, too, thought it would be great over some rice. Heck–even toast for that matter! 🙂 Cheers! it’s a 7.25 qt. wouldn’t get you anything less. I adore this dish and yours looks scrumptious.Now, in my middle age, I finally got a cast iron Dutch oven for the holiday. It’s on the stove 4-5 days a week! Thanks so much! I know what you mean—if I’m not using it, it’s still on my range. Gorgeous with that added pop of color for the kitchen. 🙂 Have a great weekend! yum-oh-my! that looks frickin’ good. i’m so going to try that recipe and agree about the stock substitution over port (maybe i’ll try a nice red?). Oooh, a Gremolata would be divine on this! p.s.s. our sister introduced me to the bar keepers friend, which is a cleansing agent that you can buy at most stores including target. it cost a little more than similar products like ajax or comet, but it’s totally worth it! i can’t believe i never knew it existed until now. i HATED cleaning my dutch oven until i started to use this. just make a little paste with some water, and it will polish your dutch oven like brand new! (it will also take all of the grease stains – even old ones – off your stainless steel pans). did i say how much i love it?? Wow..you have completely sold me. I received a dutch oven for Christmas and have not taken it out of the box. I will give it a try this weekend. Thanks for sharing! Wow! I love short ribs! That’s a nice piece of meat to break in the dutch oven. This dish looks great. I need to get me a dutch oven. Thanks for checking out this post, Janice. 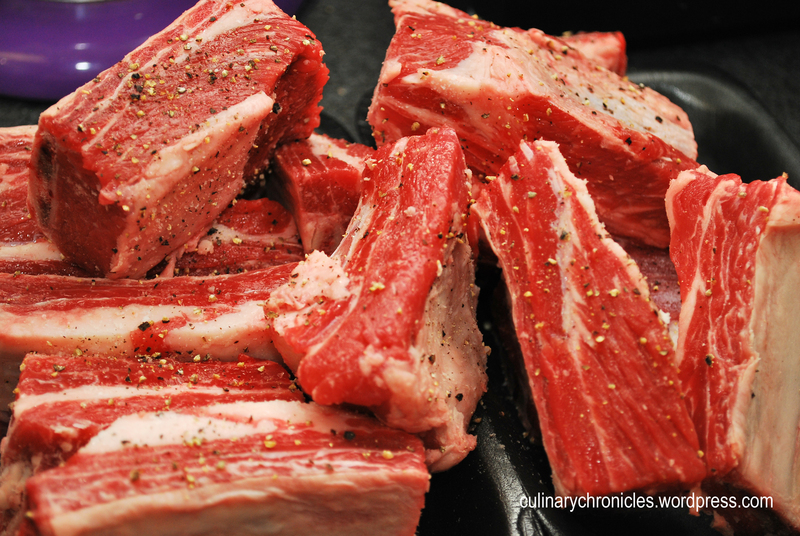 Aren’t short ribs divine? So delish! 🙂 Have a wonderful weekend! I don’t know why Dutch Ovens, along with Clay Cooking Pots are not more popular than they are. They do wonders for food. Just compare Crockpot cooking to Dutch Oven cooking. For my tastes there is no comparison. Best to you and your family! Thanks for stopping by! I think Clay Pots are wonderful and lend such a delicious flavor to their dishes. I have yet to pick one up but it is on my “MUST HAVE” list.